No one will believe that this decadent dessert is good for you! 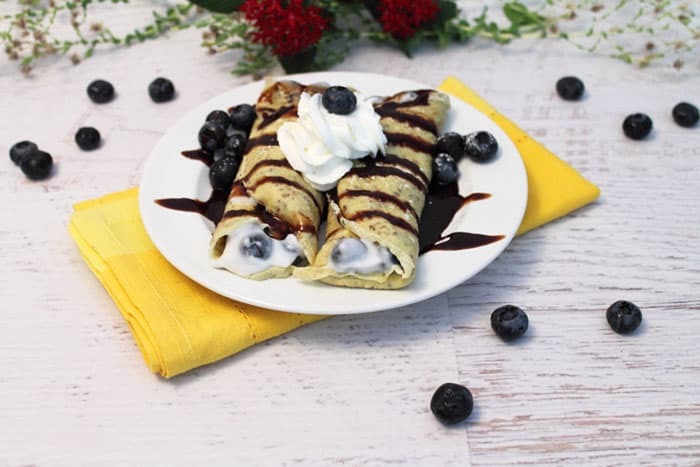 Healthy crepes, made with seeds & grains, are filled with blueberries & flavored yogurt then drizzled with dark chocolate. It’s the perfect no-guilt dessert or even breakfast. Just sayin’! As always, the recipe and all opinions expressed here are 100% my own. 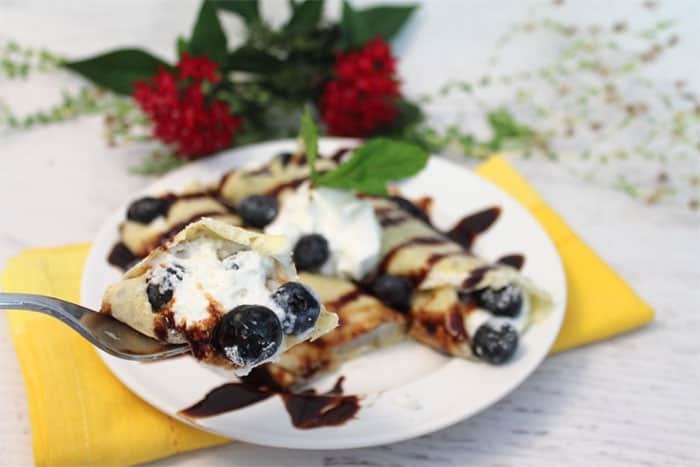 Disclosure: I received complimentary samples of Barleans products to create this healthy blueberry crepes recipe for #RecipeMakeover week. This week is all about taking some of your favorite recipes and giving them a little healthy makeover. So a few of my food blogger friends got together for what we like to call #RecipeMakeover week. We all want to eat healthier and enjoy life to the fullest so what’s better than taking a favorite recipe and making it better for you. Now, if that recipe just happens to be a dessert, it begins to sound even better. A dessert that’s actually good for you! You betcha! And it’s one delicious fantastic one at that. 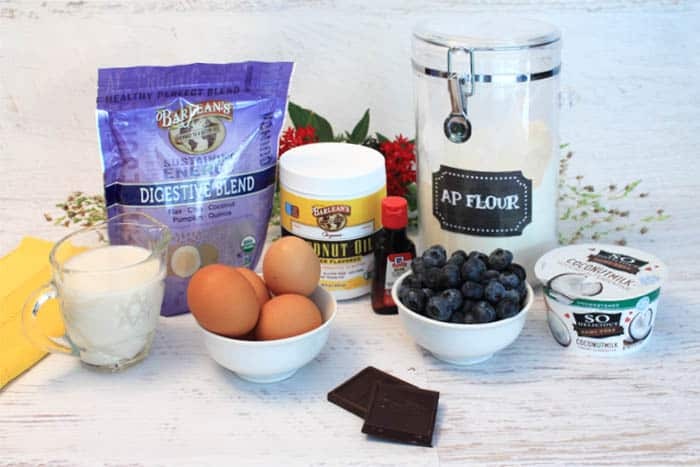 One way I like to cut down on calories in dishes is to sub out high fat creams and add either fat free half and half like in my Zoodles Carbonara or use a healthy Greek yogurt as I did in these Blueberry Oatmeal Muffins? You can also exchange unsweetened applesauce for some of the sugars and oats in exchange for some of the over processed flour in most baked goods. Another alternative is to boost your recipe with add-ins such as seeds or quinoa and healthy oils like coconut oil and flax seed oil. 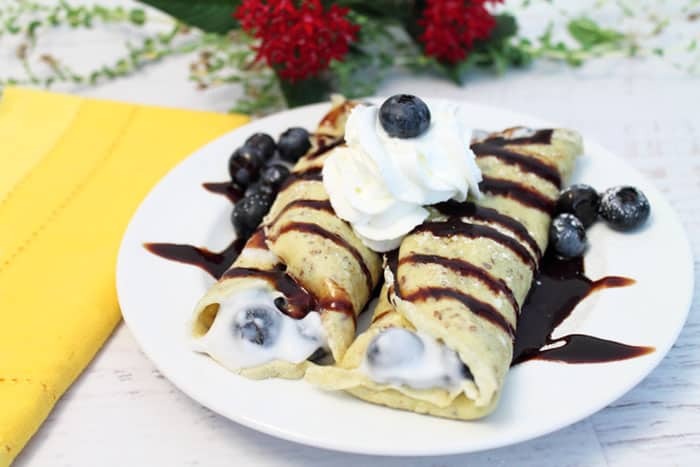 Barleans has a great lineup of seed blends like their Energy blend, Antioxidant blend, Superfruit blend and Digestive blend, the latter of which I used in these beautiful dessert crepes. It contains flax and chia seeds, coconut, pumpkin and quinoa, which provide plenty of plant based protein, dietary fiber and antioxidants, How can you go wrong with that? Barleans also has the most delicious coconut oil and it’s butter flavored! 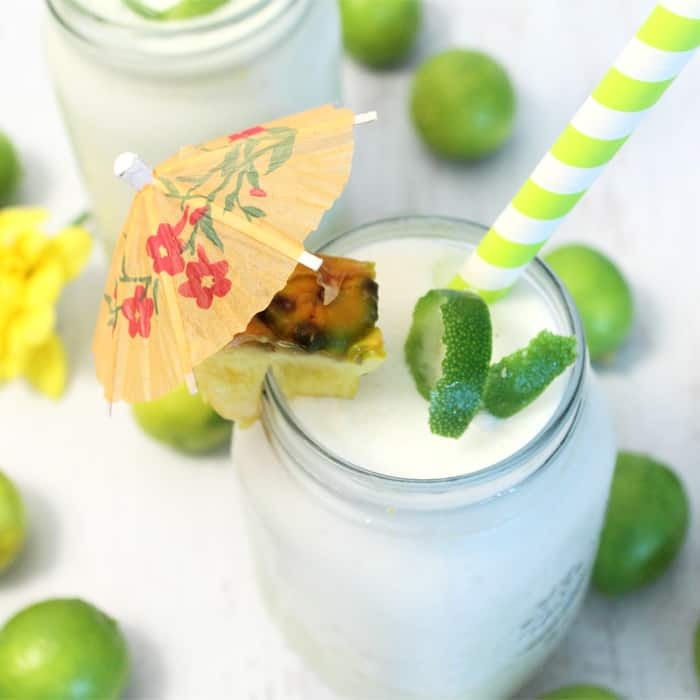 I’ve been using coconut oil for a while now in my recipes and I have to say that this one is absolutely fantastic! And coconut oil is so good for you. It has been linked to healthy heart and cognitive functions as well as converting more easily into energy rather than fat. It is gluten-free, dairy-free, soy-free and has no trans fats. Sounds like a winner! So I bet you’re wondering now if this dessert can possibly taste good with all these healthy, nutritious add-ins. Well, the answer is an unqualified YES! When you sit down to this dessert you are going to want to lick the plate clean. It’s super rich and delicious and, the best part, it’s fantastically good for you too. 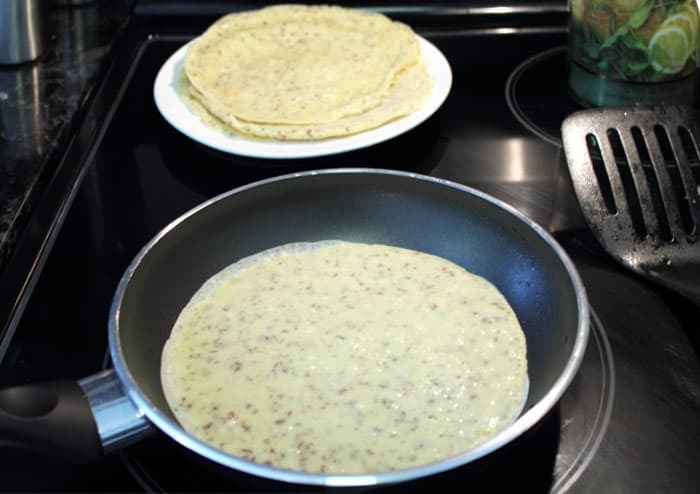 I started with an easy to make crepe mixture to which I subbed out part of the flour for Barleans seed blend and coconut oil for the standard vegetable oil. 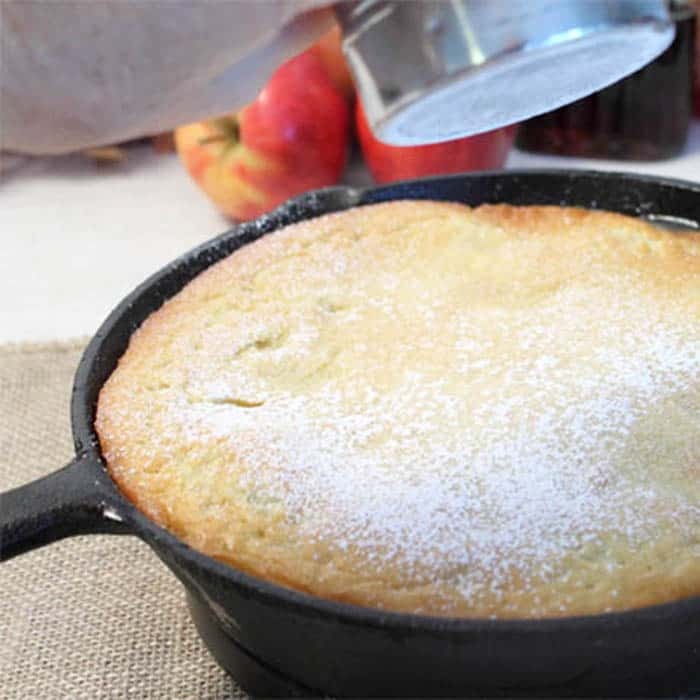 Using a small 8″ nonstick skillet, lightly coat it with Barleans butter-flavored coconut oil. Add a scant 1/4 cup of batter, swirl to coat bottom of skillet and wait until the outer edges look dry and the center looks set. Watch carefully because they cook up super fast and you’ll have a stack of lovely looking crepes before you know it. For the filling, I went all healthy. I used a plain Greek yogurt, no added sugar, and added a touch of almond extract to bring out some flavor. You could also use vanilla or even lemon extract and it would be delicious. Of course, I also had to try it with whipped Greek yogurt and it came out even better, although it did have slightly more sugar in it, but the texture was closer to the standard cream cheese or marscapone filling. Add in the blueberries and you’re on an antioxidant high. Now it wouldn’t be dessert in my house unless it had some chocolate. Are you with me? So I melted some dark chocolate, which is also on the good for you list, and drizzled that over the crepes then sprinkle with a little powdered sugar just to make it look pretty, I know you’re probably drooling by now, so dig in! Of course, you could add a little light whipped cream if you have to. Go ahead, you’ve already cut so many calories from the original that you deserve a little extra. Try this and you’ll want to make it again and again and in all different combinations. I think strawberries or raspberries would be awesome! Now go ahead, indulge in dessert and enjoy it guilt-free! And while you’re at it, check out some more #RecipeMakeover deliciousness from my blogger friends below. Oh, and def sign up for our great giveaway! No one will believe that this decadent dessert is good for you! 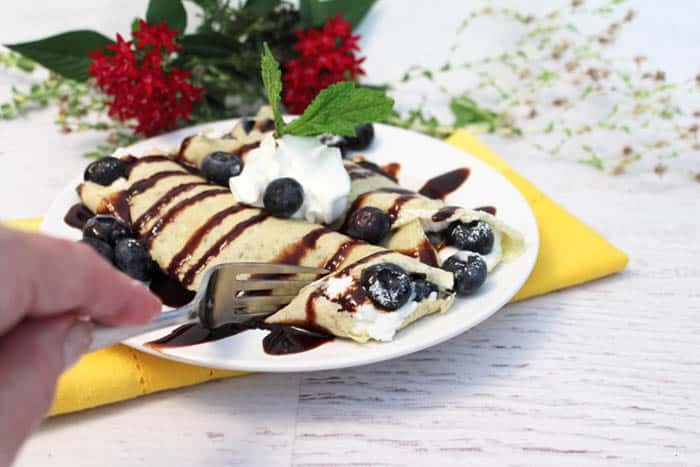 Healthy crepes, made with seeds & grains, are filled with blueberries & flavored yogurt then drizzled with dark chocolate. It's the perfect no-guilt dessert or even breakfast. In a medium bowl, whisk eggs well then add milk, coconut oil and extract. Mix in dry ingredients and stir well. Heat an 8" nonstick fry pan, lightly coated with Barleans coconut oil, over medium high heat. When it's hot, pour in a scant 1/4 cup of crepe batter. Swirl pan immediately to coat bottom. Cook until it looks dry at edges and center looks set. Flip and brown other side. Remove from pan and repeat with remaining batter. Prepare filling by mixing yogurt with berries. 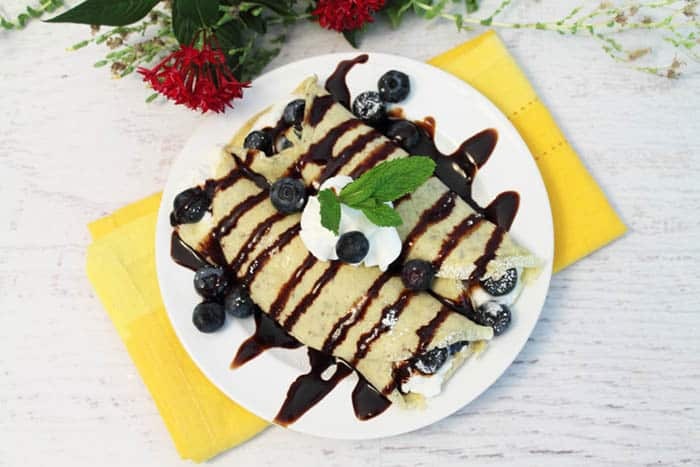 Assemble crepes on serving plates as they are hard to move once prepared. 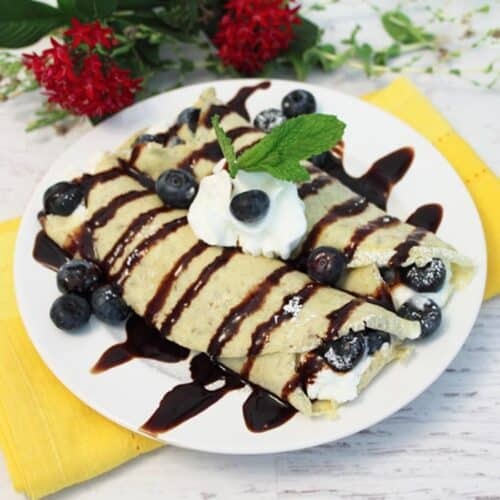 Lay out one crepe, fill with blueberry-yogurt mixture and roll up. Assemble second one in the same manner. Drizzle with chocolate syrup or melted dark chocolate then sprinkle with a little confectioner's sugar, if desired. 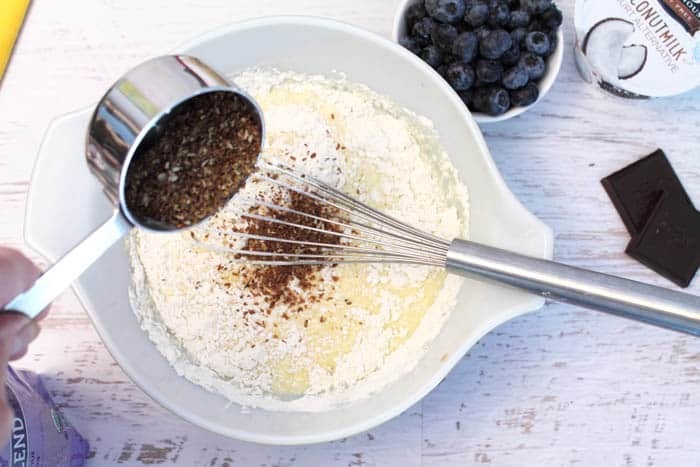 Garnish with a few extra blueberries and, if you really want to get decadent, a little whipped cream. If you only want to fix a few servings, the remaining crepes can be frozen. Once cool, stack the crepes & place a piece of wax paper between each one. Place stack in resealable plastic bag. Freeze. 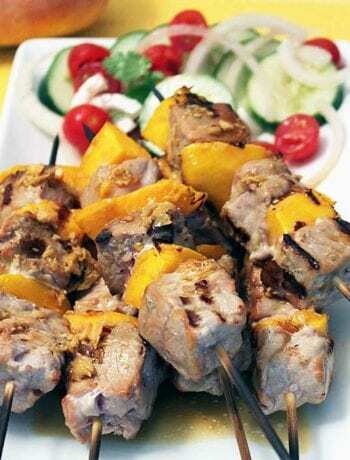 When ready to use, remove from freezer and thaw in refrigerator. When ready to assemble, reheat stack in microwave for 15 seconds. The crepes will keep up to 2 months in freezer & about 5 days in the refrigerator. I like that you added the digestive blend right to the batter. They look so tasty. I took a chance on adding it to the batter and was so happy with the way that the crepes turned out. It was so good that I know I’ll be subbing this digestive blend for other flours in muffins and quick breads in the near future.